I’ve spent a couple of weeks on this now, and finally have it to the point where I think it’s perfect, there’s nothing else to add or do to it (such a relief). I’ll probably try to figure out how to freeze it at some point, but for now I can’t stand not cracking into it as soon as it’s out of the oven. Enjoy! 2. 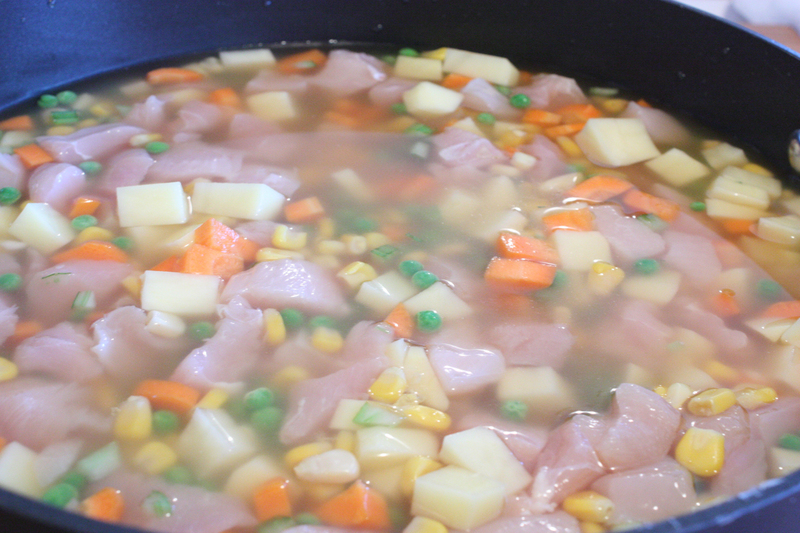 In a large saucepan, combine the chicken, carrots, peas, corn, potatoes, celery and chicken stock. Stir to ensure everything is covered with the stock. Cover and boil for 15 minutes. Remove from heat, drain into a colander set over a bowl to retain the stock for later. Set the chicken mixture and stock aside. 3. In the same saucepan over medium heat, melt the butter and then cook the onions until translucent and softened. Add the garlic and cook until fragrant, 15 seconds. Stir in the flour, salt, pepper, old bay seasoning, poultry seasoning, garlic powder and celery seed. Whisk in the chicken broth, milk and cream in 4 batches, ensuring that the mixture is well combined between each addition. Simmer until starting to thicken, then remove from heat. 4. 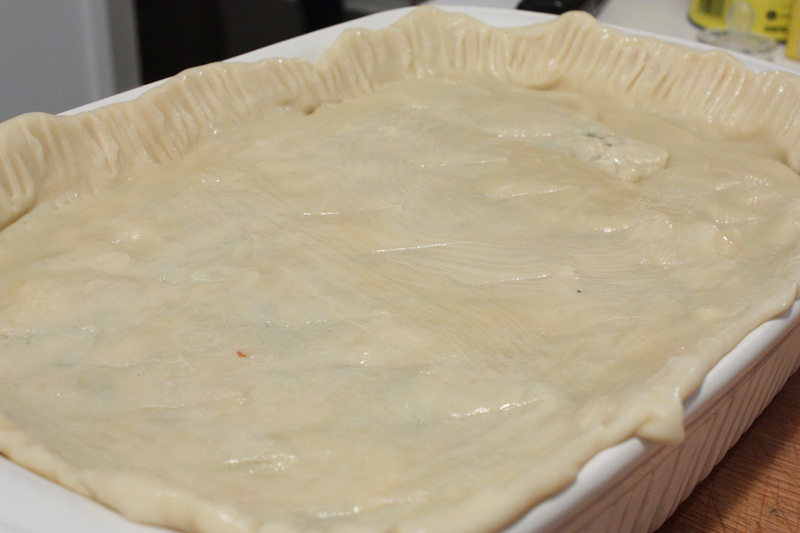 Roll two of the pie crusts together, creating a large rectangle. 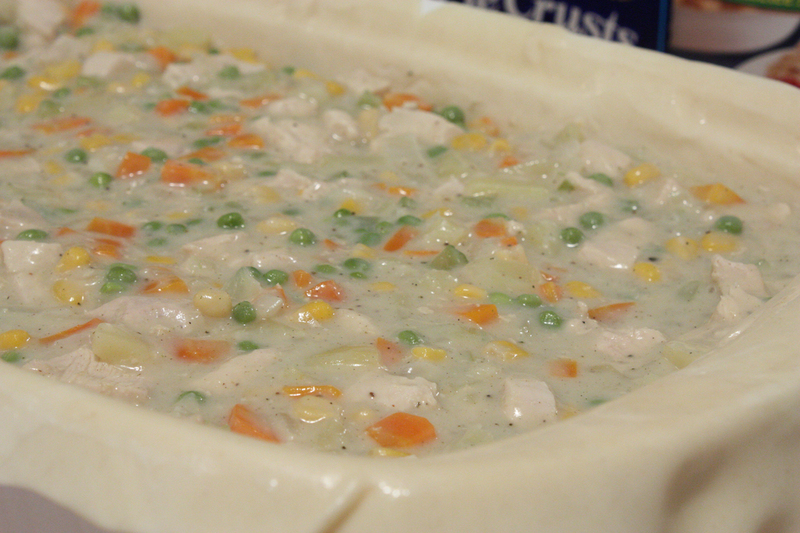 Fit the pie crust into a 9″ x 13″ baking dish, ensuring at least a ½” overhang all around. Brush the crust with the beaten egg, then pour the chicken and vegetable mixture into the crust. Evenly pour the sauce over the chicken mixture, and use a wooden spoon to move the filling around to make sure everything is covered. 5. Roll the last two pie crusts together, then top the dish, sealing and crimping the edges. Brush the top crust with the beaten egg and poke several small slits into the top crust to allow steam to escape. 6. Bake in the pre-heated oven for 45 minutes, until the pastry is golden brown and the filling is bubbly. Cool for 10 minutes before serving.